This example project will give you a quick overview of Azure Functions' serverless capabilities, so you can run your code without caring where it's running from. What’s up guys, Eze is here. During our last posts we were talking about Firebase, AngularJs, and a bunch of cool tools to create rapidly powerful front-end apps, in case you missed it you can check here. Today, I want to bring you some server side code that runs in a serverless architecture. Yes, we are going to talk about Azure Functions. An event-based serverless compute experience to accelerate your development. It can scale based on demand and you pay only for the resources you consume. 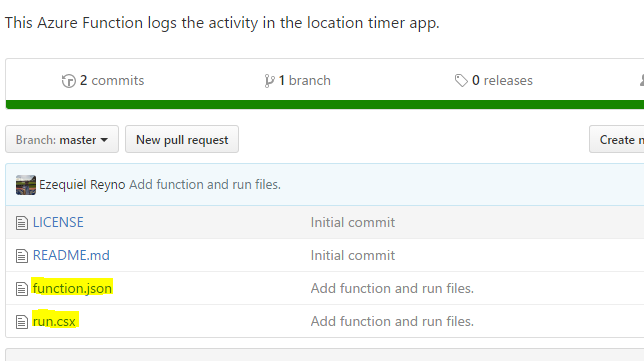 Trigger by time: Azure Functions uses CRON job syntax to specify an event based on a timer. So let's say that we want our code to run every 10 minutes. Azure service event: We can set up our function to execute every time something happens in an Azure service. For example, when a new file is uploaded into blob storage. Serverless web application architectures: This one in particular is the one I've used for our example. In this case, a front-end app calls a function to execute a procedure on the server side. As you can see in the image below, the Azure function is made up by two files: The first one is function.json, which represents the structure of our function — basically the metadata of our function. The second one is a run.csx file (because I'm using C#), which is the method we want our function to execute. Microsoft offers us a web editor to edit our functions directly in the browser, but if we want, we can configure a GitHub project and set up an automatic deploy when we push to our repository. And there you have it! For more details on Azure Functions, you can use this link.